"There were, even, little crocodiles of piously-dressed, slant-eyed, yellow-faced pupils to greet the nuns, and of lay-workers to greet the monks...Only the two French-Canadians, genial but suspect as ever, were left to themselves, wildly photographing gendarmes, customs-house officials and departing passengers alike. 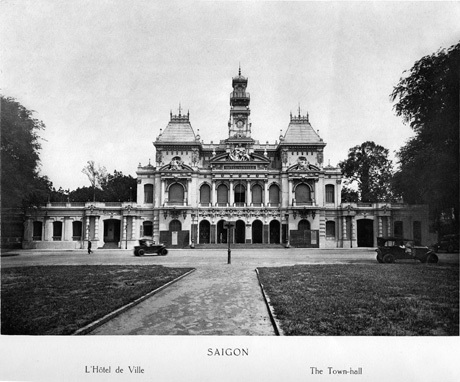 But as we drove into the town, it became plain that Saigon was, in fact, an achievement, unique, a French city flowering alone out of a tropical swamp in the farthest corner of Asia. Once there, within its narrow confines, it is as though, in the manner of the polite fiction adopted by embassies the world over, you stood upon the actual soil of France."